300+ paged book on Green Arrow? You have got to hand it to writer Richard Gray and publisher Sequart Organization for investing the time and effort into this unlikely character study. That said, Green Arrow has probably never been more popular than in recent times, thanks to the CW TV series, Arrow – having being renewed for a SIXTH season. Like any other superhero character that has lasted 75 years, there is a fair amount of history and evolution to discuss and that is exactly what Gray achieves in Moving Target. 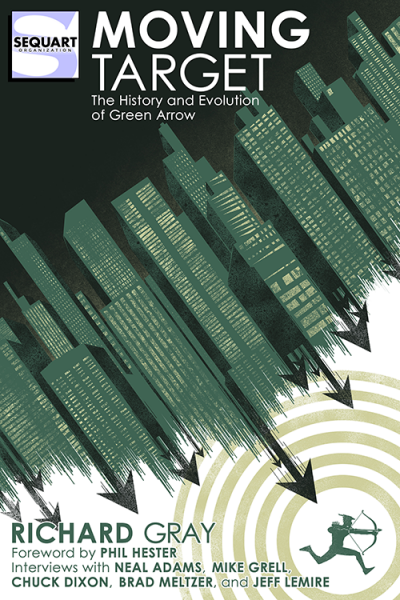 Gray takes us meticulously through the various incarnations of Green Arrow over the years providing us with the historical context and highlighting the key creators involved in the process. In this respect, Gray focuses on the role of writer Denny O’Neill and artist Neal Adams in re-inventing Green Arrow (in the early 70s) from a poor imitation of the Batman to a distinctive superhero character presented in a more realistic fashion and with a political bent as well. This, more or less, set the tone for the Green Arrow stories of the last 4 decades culminating in the Arrow TV series which brings this realism to its logical conclusion. Gray leaves no stone unturned in delivering a detailed analysis of the various phases of evolution even as he moved from the fantastical world of the Justice League to his own more realistic take of his solo book, where his alter-ego Oliver Queen actually runs for office. Gray breaks down the stories for us and lays down the background behind stylistic and narrative shifts. Moving Target is an intriguing read – whether or not one is a fan of the Emerald Archer. It is once again strong evidence that comic books deserve serious analysis and consideration. Kudos again to Richard Gray and Sequart Organization for making the effort.